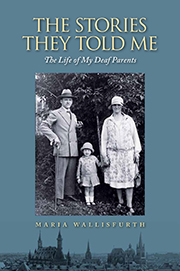 In this heartfelt memoir, Maria Wallisfurth recounts the lives of her deaf parents in Germany from the turn of the twentieth century through World War II. Her mother, Maria Giefer, was born in 1897 and her father, Wilhelm Sistermann, was born in 1896. The author captures the seasonal rhythms and family life of her mother’s youth in rural Germany, a time filled as much with hardship as it is with love. When she is old enough, she moves to the nearby city of Aachen to attend a school for deaf children, where she learns to lipread and speak. After her schooling is complete, she returns home to work on the family farm and experiences the privations and fear that accompany World War I. She later goes back to Aachen, where she joins a deaf club and falls in love with Wilhelm, a painter and photographer who was raised in the city. Amidst high unemployment, food shortages, and rapid inflation, the two are married in 1925 and two years later the author is born. Under the Nazi regime, Maria and Wilhelm are ordered to undergo forced sterilization. Although their deafness is not hereditary and they submit applications of protest, they are compelled to comply with the law. Despite their dissimilar backgrounds and the political circumstances that roiled their lives, the author’s parents showed great love for each other and their only daughter. The Stories They Told Me is a richly detailed document of time and place and a rare account of deaf lives during this era. Maria Wallisfurth was born in 1927 in Eilendorf, near Aachen, Germany, and was trained as an actress. After her marriage and the birth of her two hearing children, she worked for more than 20 years in the Aachen City Theatre. She currently lives in Aachen.